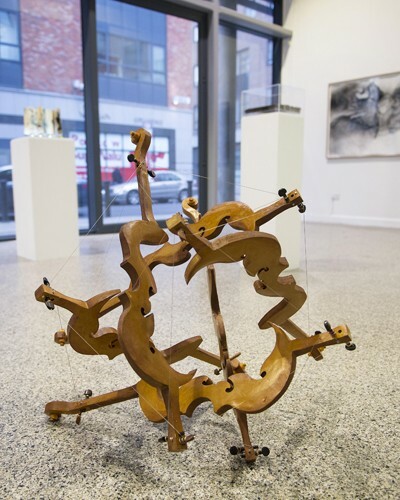 Méadhbh O'Connor, 'Capriccio', 2015. 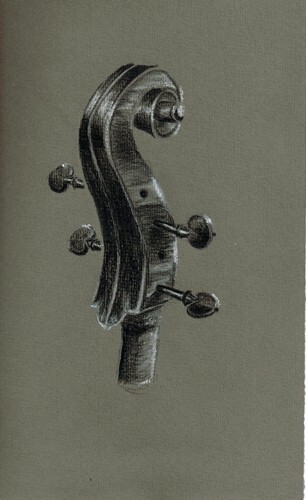 Wood, viola string, violin pegs. The sculpture is held together by opposing forces of tension and compression. No two solid members of the sculpture touch one another. 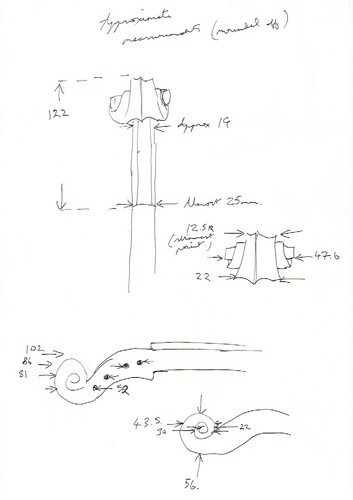 'Capriccio' by Méadhbh O'Connor. Image by Vincent Hoban, UCD. Group exhibition with Mark Cullen, Cindy Cummings, Fred Cummins, Emma Finucane, Sofie Loscher, Méadhbh O'Connor, Siobhan McDonald, David Stalling. 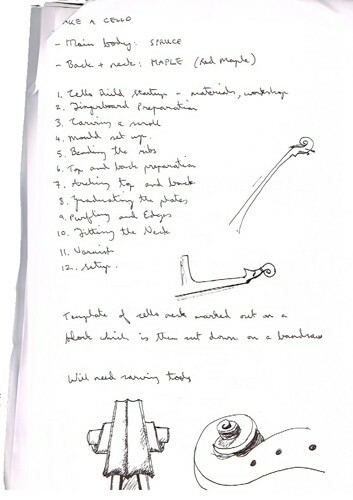 Extracts from the project notebook. Extracts from the project notebook. Pencil Drawing by Méadhbh O'Connor for 'Capriccio', 2015. 'Capriccio' under construction. 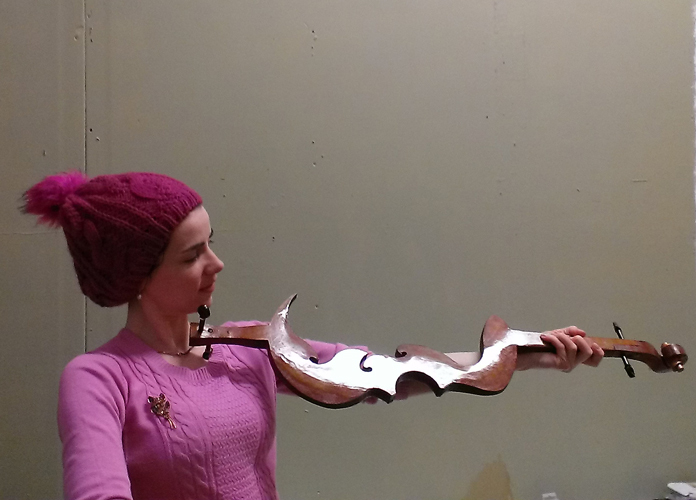 Méadhbh holds one of the struts after french polishing. 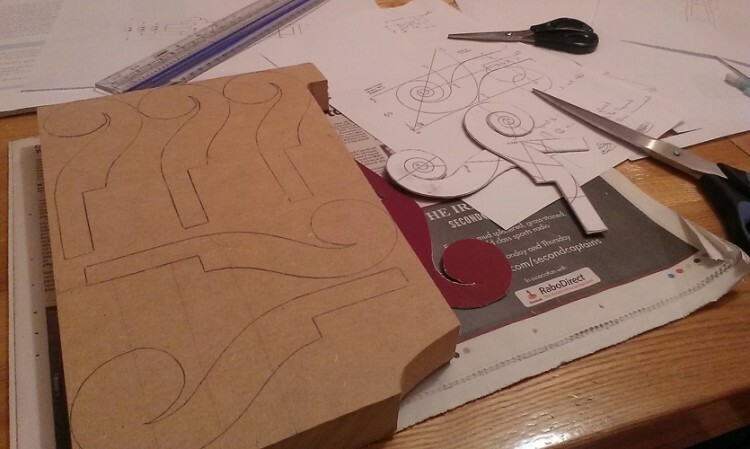 The struts in their raw state, before carving three-dimensional curves. 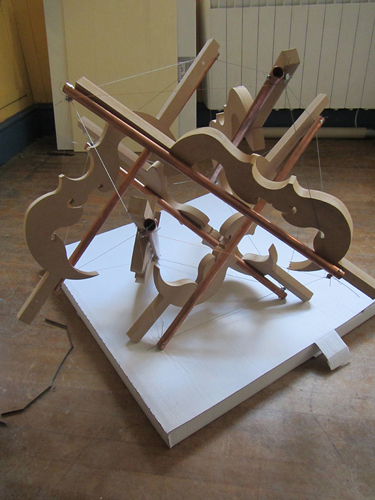 Modelled on a test tensegrity piece made of copper pipe and cable. The sculpture under construction. 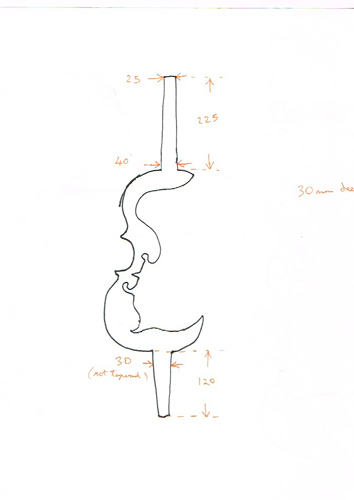 The struts were positioned on a jig (cube) in a series of right angles. 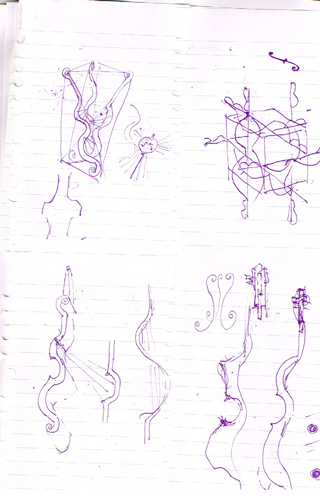 The musical strings were connected and tensioned at this point. 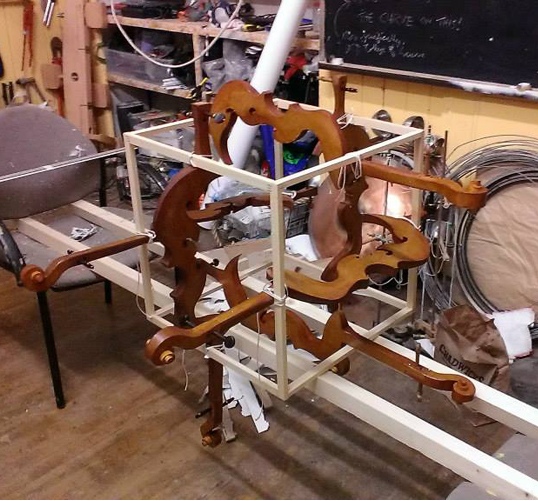 Once all parts were in position and tensioned, the sculpture was removed from the jig by cutting the jig apart. 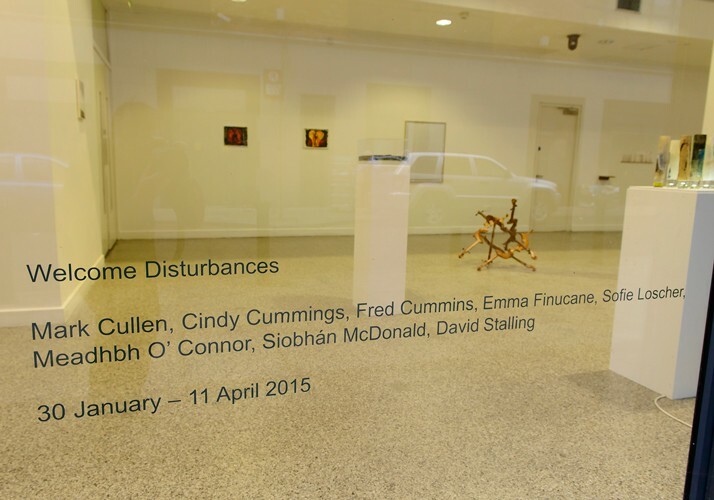 Welcome Disturbances, the first group exhibition of artists who held residencies with the UCD College of Science. Curated by Emer O Boyle (Founder, UCD Art In Science) and Sheena Barrett (Dublin City Council Arts Officer and curator at The LAB). 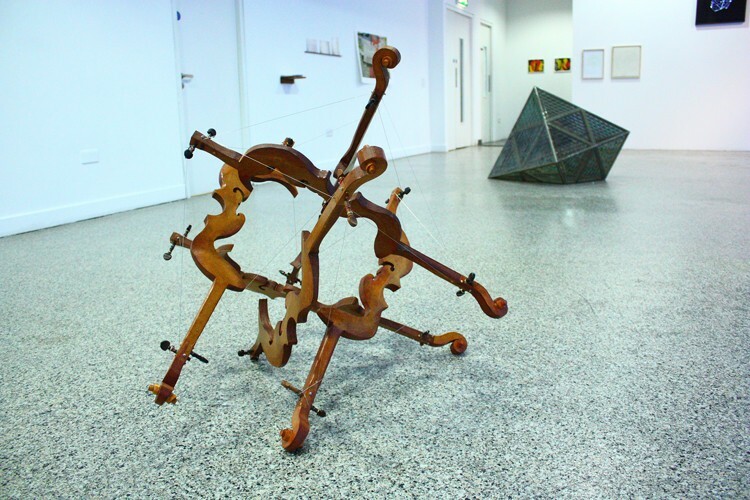 The exhibition also included an extensive programme of talks and events delivered by artists and scientists involved in the UCD Art In Science programme, and other invited guests. More. 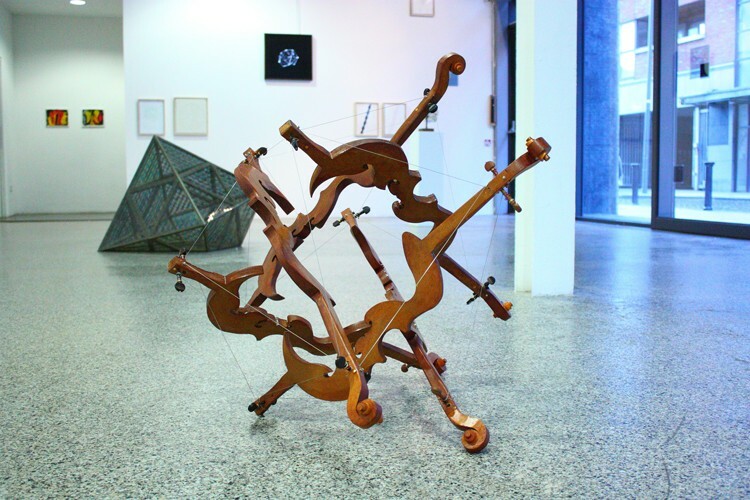 For Welcome Disturbances, Méadhbh presented ‘Capriccio‘, a sculpture built using the principles of tensegrity. The sculpture is held together in a web of equilibrium achieved by opposing forces of tension and compression. Violin pegs are used to tension musical strings connecting the 6 wooden struts. No two solid members of the sculpture touch one another.